Homes for local people have been provided by the Society since 1932. There are family homes and bungalows with gardens. Also flats with communal facilities and grounds for people aged over 60 years. A warden supports these residents according to their needs. There are few vacancies as residents rarely move away. Some have lived in the area all their lives, near their families and friends. A recently refurbished community room at Fordington Hill House is used for coffee mornings, darts evenings, fish and chip lunches, talks and meetings. Residents can book the room for events and socialising. Please contact Judith Dearlove to book the room. 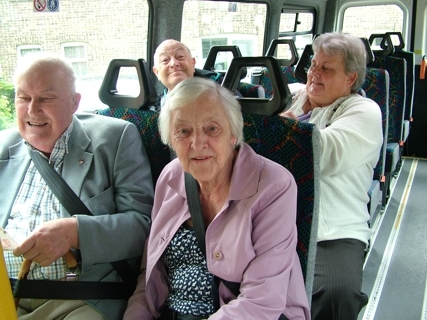 A monthly shopping trip to Weymouth, travelling in a minibus is popular. A volunteer driver picks residents up from their homes and delivers them back with their shopping. The trip provides plenty of time for chat over tea. Please contact Rosie Sibley if you want to book a seat. Contact Michelle Powell for housing management, including rents, lettings, repairs and maintenance. Contact for general enquiries, Society management and organisation, committee matters, Mill Street history and complaints. The warden service is available for residents in sheltered housing: Weekdays 9am-5pm.